Capitol Hill Cooperative Playschool is a cooperative, a wholly parent-run playgroup for Capitol Hill 2 year olds. CHCPS is non-denominational. The CHCPS experience provides a warm, supportive environment for 2-year-old play as well as the opportunity for parents to meet other families in the neighborhood. We meet in a sunny, basement room at The Lutheran Church of the Reformation at 212 East Capitol Street, NE Washington, DC 20003. Generally the playschool begins at 9:15am and ends at 12:30pm. Often, duty parents take children on an outing. Children may attend 2 mornings per week (Mon/Wed or Tues/Thurs), 1 morning per week (Friday), or 3 mornings per week (one of the 2-morning groups plus Friday). Families apply for the playgroup they wish to attend in the lottery. Once families are chosen through the lottery, three playgroups are formed based on order of lottery selection one for Mon/Wed, one for Tues/Thurs, and one for Friday. A playschool morning is informal but usually includes playtime (we have toys, arts, and crafts), a trip to the small outside play area or a nearby park; and songs, movement and dance, story time, or other favorite 2-year-old activities. There is a mid-morning snack and the morning ends with lunch (you pack your own). Three parents supervise each group meeting. 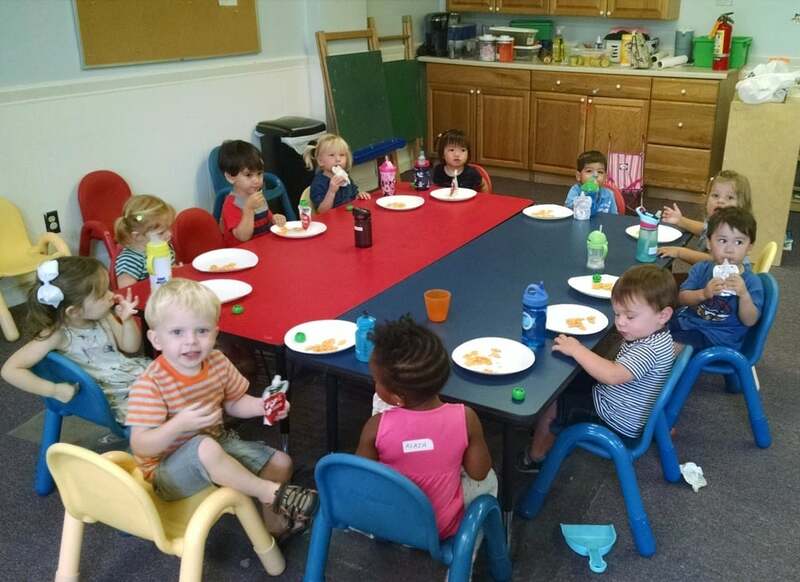 Children eat snack and lunch together at playschool. The playschool year begins in September after Labor Day and ends in early June. Generally, we follow the calendar of the DC Public Schools calendar, but each class determines how closely they follow the DCPS calendar. Parents of enrolled children commit to working 2-3 mornings per month (4-6 times per half year) to supervise play and bring snacks. Typically three parents run each playschool group: one parent coordinates an activity, the second brings snack, and the third is a "floater" who helps with supervision. There is no staff. Coop duty is required and can only be fulfilled by a parent (not a grandparent, babysitter or friend). The playschool also has a board comprised of playgroup parents who volunteer to serve in various roles of responsibility for general oversight of the playschool. *Two-day playgroups dues are $275 per year. *Friday-only playgroup dues are $150 per year. *Combined two-day and Friday enrollment dues are $425 per year. Dues are paid for the entire year before playschool begins in September. There is also a $25 non-refundable application fee. CHCPS is a cooperative playgroup. It is not a child development facility licensed pursuant to the Child Development Facilities Regulation Act of 1998, effective April 13, 1999 (D.C. Law12-215; D.C. Official Code § 7-2031 et seq. ).